(Watertown, MA) A Bright Room Called Day transports us back to a sitting room in 1930s Germany, inhabited my minor actors, eccentric filmmakers and artists. This bohemian gaggle of comrades band together in the early 1930s through their love of Communism, Art and Revolution. As 1933 marches on, the world around them darkens and the sitting room becomes their last refuge from Hitler’s rule. In this Brechtian-esque drama Hitler’s Germany is paralleled with Reagan’s America, as we watch Rosa frantically write death threats to the President, because he is wilfully ignoring the AIDS crisis. The premise is ambitious, however unfortunately the script and at points the acting, often fell short. Kushner’s time travelling narrative leaves little room for audience interpretation, his message is loud and clear – it is not only in 1930s Germany that evil exists. Kushner was specifically framing Reagan as evil for his refusal to address the AIDS crisis. Nevertheless the play’s themes of political corruption, persecution and populism ring all too true in today’s world as well. 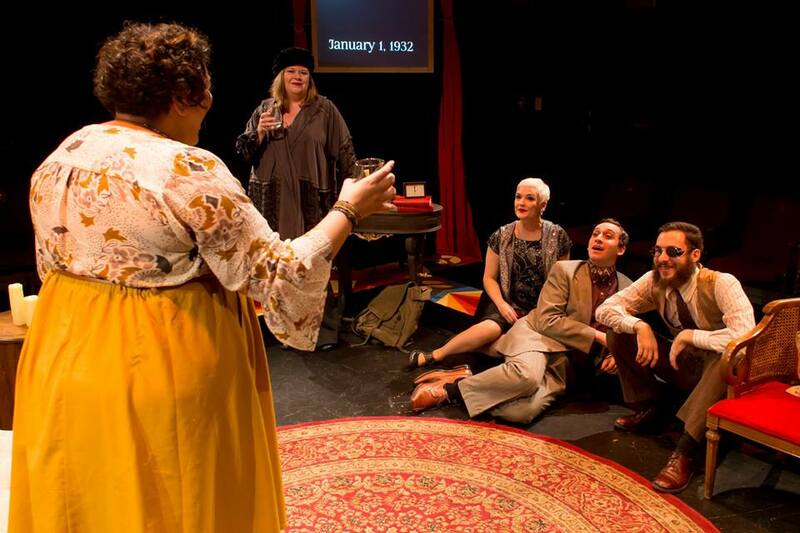 A Bright Room Called Day centers around the character of small time actress Agnes Eggling (Lindsay Eagle), who is desperate for the German Communist Revolution to succeed but reluctant to play a main part in staging it. The other characters in Agnes’s world are equally flawed and self absorbed, holding themselves aloof from the masses they supposedly long to serve and protect. Sitting in the beautiful Mosesian Arts Center in Watertown, whilst white supremacist rallies burst up across the country, it is hard not to cringe at the obvious comparison. The use of the film titles as part of the set was superb, varying between the absurd and the abhorrent. The cinematic titles simultaneously were evocative of early 20th century cinema and a constant reminder that ‘history’ is a story spun by the winners. The use of the screens also helped to build on the sense of Verfremdungseffekt – Estrangement Effect – which sits at the core of this anachronistic narrative. Zillah, the conspiracy theorist who randomly intersperses the play with letters of rage to Preside Reagan, is one of the most intriguing but undeveloped characters in the play. Zillah is explicitly Kushner’s mouthpiece, urging the audience to stop venerating the Holocaust as the absolute standard of evil and ignoring the evil that surrounds us every day. Kim Klasner brought some warmth to this complex woman, however at times her performance felt self-conscious. In A Bright Room Called Day we watch as the good guys fail, not because of their own mistakes but because of a collection inaction in the face of evil. Edmund Burke’s famous words linger unspoken but clearly visible at the surface of Kushner’s play: “the only thing necessary for the triumph of evil is for good men to do nothing”. Overall Kushner was overly ambitious in A Bright Room Called Day and Flat Earth Theatre did a good job of trying to unite an ultimately disjointed narrative. The play serves as a chilling reminder of the speed at which democracies can fail when good men do nothing. Flat Earth Theatre call on the audience to ‘resist’ and the play is an important reminder of why. Updated 10/11/17: Kim Klasner played Zillah. Lindsay Eagle’s name has been corrected. Apologies to the cast! This entry was posted in Drama and tagged A Bright Room Called Day, Alissa Cordeiro, Dori A. Robinson, Edmund Burke, Flat Earth Theatre Company, Germany, Kim Klasner, Lindsey Eagle, MA, Mosesian Arts Center in Watertown, Polly Goss, Tony Kushner, Verfremdungseffekt, Watertown by Polly Goss. Bookmark the permalink.